The Michigan at Utah game on September 3 is one of the biggest in college football this season, with an average resale price of $310. That makes it the tenth most expensive game in college football, and more expensive than any Michigan home game, including Ohio State at Michigan, which currently has an average resale price of $283. Interestingly, in the last few months the listing prices have climbed for the Michigan-Utah game, something that does not usually happen with sporting events. A month ago the median listing price was $399, but currently it is $422, an increase of six percent. This may not sound like much, but typically this close to an event the price would be dropping, so any increase it noteworthy. To see just how much interest the game is driving in Utah, one can look at the prices of the rest of the Utes home games. If you take the Michigan game out of the equation, the average resale price of a Utah football ticket this year is just $64. 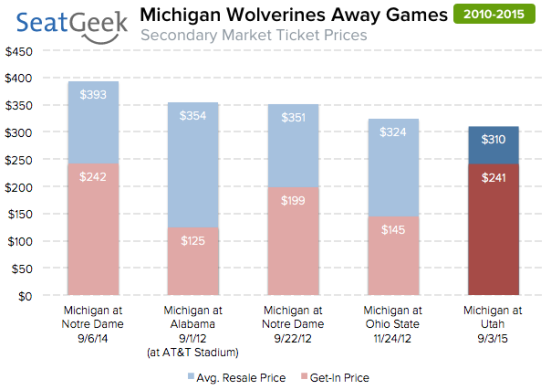 That’s almost a fifth of the price of a single ticket to the Michigan game. This game is actually the fifth most expensive Michigan away game over the past five years, with the priciest being Michigan at Notre Dame on 9/6/14, costing an average of $393.